Hello Renee Hribar here and welcome to the “S” Word LIVE. My name is Renee Hribar and I am a TedX speaker, sales strategist, and author and my goal today is to make sales simple and fun. So I’m actually holding my notebook today, but somebody buzzed me today and they asked me why I do jazz hands. And I’m like jazz hands? I wonder do I then? I realized I do you know what? So what? It’s all happening organically. So it is, I am who I am. Didn’t Popeye used to say that? So if you are brand new here, say hello as you join. The “S” Word LIVE is a show that I do every single week. And it’s meant to help give you some free sales training. I work with thousands of people. I’ve helped thousands people sell millions of dollars over the course of my career and my goal is to help kind of take away the stigma and make it a little bit more of a fun easy thing. And that’s why I think my personality fits this and I’ve been doing it for so long now. I can’t separate it. So ultimately if you’re ready to have some fun it’s high noon on Wednesday. I am ready to give it to you. Today I’m talking about something that I talk about a lot in a lot of different ways. So if you’ve hung out with me for any length of time you probably have heard me talk about how good sales people have a good pitch whereas great salespeople ask great questions. Have you ever heard me say that before? Have you ever heard me say that before? Good sales people have a good pitch, great sales people ask great questions. And so for a majority of the women that I work with today they are business professionals who for many reasons have chosen to hang up their own shingle become a consultant or a coach or a strategist in their field of expertise. So they’re truly experts at what they do. They’re not they’re not Googling the answers right. They’re not Dr. Google. They know how to do the thing that they’re consulting on, that they’re coaching on, that they’re giving you the strategy with. The challenge that many of them face and this is where I meet them is that they’ve never sold for themselves before. They were working for a company that valued their opinion and valued their experience and paid them handsomely, and probably are still recruited knowing my clients. They’re getting hits on LinkedIn all the time asking them if they’re available for dates, and they say “yes, for consulting dates.” So many of my clients have left their corporate role at said company and then gotten brought back in as a corporate consultant at the same company for more. OK. So when it comes to sales asking great questions is the key. But there are some big mistakes that I want you to avoid when asking these questions. So let’s talk about those. Tell me, are you ready to hear about these big mistakes that you can avoid when asking questions? Tell me yes or no in the comments, and I will share them with you. So the number one thing is this is that as we go approach the asking questions phase of the sales process, and sales can be a puzzle. It doesn’t have to be mysterious. A lot of times the you know the pictures on the box you just got to follow along. Tell me if you have ever been concerned about the type of questions or worry that your questions weren’t the right questions. So let me know in the comments as you’re listening and please share this with a friend if they are truly in the online space or even in the online space where they have to sell for themselves if they’re a lawyer or a real estate agent a doctor or a coach or consultant and they have to be the one who truly discovers if this person who’s approaching their business is the right fit, then this specifically will help them. So the number one thing is when you approach the question asking process, there has to be a very specific way that you approach it. So for example, if the doctor comes in the room, if you’re sick, you have a problem, you have an issue, and you go to the doctor to ask for help. You come in the doctor’s not like Hey how you doing? So what have you been up to? I mean that you’re sick. You have a problem. You have an issue. So the doctor says I’m glad you’re here. Thank you for coming your appointment. Well I’ve got 20 minutes and we’re going to find out, we’re gonna do some diagnostics, right we’re gonna ask some questions, and do some tests, and then we’ll have some answers for you. All right. Or I’ll offer you some possible protocols, or I’ll offer you some possible solutions. Have you ever heard, been in the room, or been the person with the patient where this has been taking place? Let me know in the comments. Yes or no. You’ve been sick, you’ve been ill, you go to the doctor, the doctor comes in, and the doctor issues the question portion of the interaction as, listen he frames it out. We’re just gonna ask questions, take a few tests, and then we’ll be able to give you our best suggestion. Heather says diagnostics, tests, possible solutions. You got it. Thank you Heather. Awesome. So the doctor comes in. He is an expert. He doesn’t have to prove to you that he knows what he’s doing. And ultimately though what does he also have around him? He has his degrees, right? He has his white jacket on. Or she. My doctor’s a girl. It has the name. He has his name on it or her name on it. And they’re taking notes right? So they’re taking notes. The doctors come in, his degrees or her degrees are on the wall, the white coat is on, so they’ve presented themselves as they’ve been told to do, which is professionally, clearly, and with the intention of getting to the bottom of this of the issue. Right. What is the problem? What is happening inside of your body that’s making you ill or making you sick? That’s making you come to the doctor’s office? Say hello as you join, so whether it’s live or on the replay let me know because this is huge. I could talk about this for months. In fact, for the women that are in my Sell Like A Mutha’ program, we do talk about this for a month. For the people that are my Mastermind, we talk about this for years at times because it truly is so vital to the ability for you to find and connect with your next paying client. It is such a vital piece right here. So I’ve gone into the first part which is come into the room and truly own the fact that you are an expert. You are professional, you know the deal, you know what’s happening, and your goal is to help that person. Right? We’re on the same page. When the doctor comes in, I want you to have three specific things going on in your mind, like the doctor does. Number one to be curious. Number two to be skeptical. And number three to remove yourself from the actual answer from whatever they say. Don’t let that affect your emotions up or down, because if a doctor’s like hey you’ve got swollen glands. Oh you’ve got swollen glands? Hey nurse we got another swollen glands case. in many of our cases. Someone comes to us, they have a question. They have a problem. We have to ask the right questions and come at it in the right way. So number one, be curious. So let’s review this. To be curious I need to know a little bit about the person to be able to be curious about the right things. Right? So if I go to the doctor’s office because I have a knee issue I don’t go to the ear nose and throat doctor. Right? So curious skeptical emotionally remove yourself in their answer. So I’m going to the right doctor. So if I have a problem with my sales I’m not going to mindset coach necessarily. I mean your mindset is great. What makes me happy and gets my mindset right is making money and connecting with the right people who need me. So that’s just me. Tell me where you are on the globe. I’m always like so curious of where people are totally like a traveler. So being curious is asking the right questions. So if I have a knee problem the doctor is not also asking me about my eyesight. chances that they’re just gonna divulge everything right up front, slim. Because it’s human nature to hold some of our cards close to our chest right? They want to possibly hold back some information because they want to potentially leverage that later for negotiations, which we can get to in another livestream. So being skeptical means that knowing that their answers, even if you’ve got the right questions, are going to need more questions. So whatever answer they have, “Oh, Doc my knee kind of hurts when I move it, when I’m playing soccer, especially when I go to make that strike right into the strike zone.” He says, “OK so have you changed shoes.” Great question. So if you were on the phone with someone or in a discovery process and you ask great question and this is how you know they’re gonna say. Great question. Keep that question around because that’s a great question, that’s how you know you’re onto something. And so I say great question Doc. I actually did get new shoes recently. He’s like have you ever did you switch brands to just switch places? Yeah. The place I used to get my soccer shoes, they went out of business and I had to go to Zappos. I’m not sure if it’s the right kind. He’s like Did you have inserts? that’s going to crush whatever you’ve got going on because as soon as you start getting excited oh oh they said they’re excited. They want to do a program As soon as you start getting excited about their answers. It changes everything. It changes the dynamic between the two of you. And then all of a sudden you become the person who’s answering the questions, not the person who’s asking them. And I want you to own the fact that your expertise is worth paying for. It is worth offering either in a program or a service. And so I really want you to understand that when you approach someone the energy I don’t want you to have as oh I hope they like me Oh I hope that they have the right answers so that I can offer them that thing that I want to offer them. Instead I want you to say you know what I have some great experience I have some great knowledge and I know I can help the right person solve these very specific complex problems. However I need to know if they’re the right person for me. So I’ll be the one asking questions, not because I’m trying to control or power anyone, but because I know my own power. And so it truly truly is about having that sense that I know that these right questions are going to help me help the right person, so that I’m not begging, hoping, wishing that they’re going to hire me. Instead we’ll be making the decisions together. And when I present those possible solutions, whether it’s Hey I’ll call you next month, or great let’s work together in an intensive, or hey there’s a great program I have, or wonderful let’s do one on one work for the next six months. Whatever those possible solutions are, it doesn’t matter to you, because you know it will always continue the conversation. If I’ve handled my questions right. So I’m excited to have shared this with you today. I hope that this piece of information makes you feel better about sales because sales does not have to be hard. And truly if you are in business for yourself there are very few things you have to master. Sales is one of them. So have a great day. Happy Wednesday. I’ll see you back here next Wednesday. You are in the best Place! Sonya Valles Durango is BEAUTIFUL!!!! Gwen Schofer do you ever hear one thing from a potential client, advise them on a certain thing but come to find out it was totally something different? I see you sell oils — I love oils! I bet you have heard clients complain that they can’t sleep and so you might suggest they try lavender but then they don’t reorder saying it didn’t help or they haven’t used it all —you ask a few more questions and realize it’s because they have allergies and something ELSE might have been better? 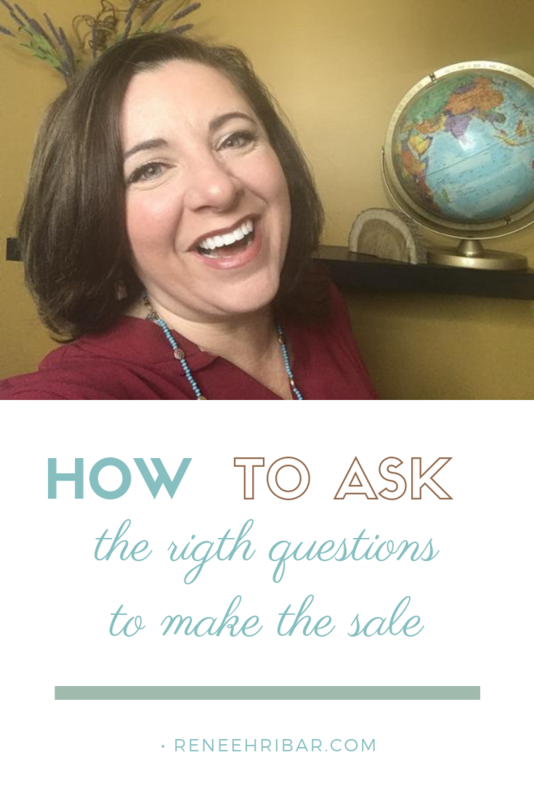 Yes, great sales people ask great questions! You have taught me that! The jazz hands make you, you! Thank you! You are a BIG part of it’s success!! So is Sell Like a Mutha! I love your jazz hands! Find out what smart women in business already know!! What would life be without jazz hands?